Weighty worlds of wonder: what's, why's and wherefore's of the Web; The open source movement; Six reasons to consider open source; The database driven web; Building block I: cascading style sheets; Building block II: PHP; Building block III: relational databases; Building block IV: database design and normalisation; Building block V: MySQL; Standards and accessibility; In pursuit of accessibility; Web development planning; The dynamic duo; The indispensable function; Database driven web applications; Case studies. Almost every organization seeks a simple means of managing, publishing and/or providing searchable web access to information. 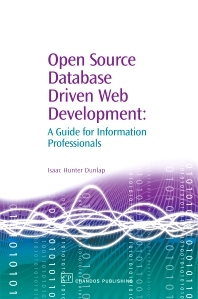 Written by a knowledgeable web developer, this book demonstrates the simplicity, cost-effectiveness, and versatility of designing database driven web applications with Open Source resources. Case studies of ‘real world’ implementations address both theoretical aspects and practical considerations of developing applications with the easy-to-use PHP scripting language and powerful MySQL relational database. Project organization and design issues are considered along with basic coding examples, accessibility standards and implementation advice. Isaac Hunter Dunlap is an experienced web developer who has created numerous database driven applications with Open Source technology. He is Associate Professor and Coordinator of Information Systems at Western Illinois University Libraries.